Swaggerjack - Privilege. Vinyl LP. Bleep. One of the finest units operating on the outskirts of Manchester by way of Salford, Swaggerjack draw out their best with a new three track album of ghosted scratch heavy electro-acoustic experimentation. 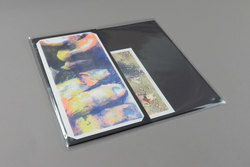 Following on from a series of long gone cassettes, the duo of Callum Higgins & John Powell-Jones finally commit their noise laden research to wax with this beautifully packaged debut of sorts album. The three long form tracks echo the ghosts of the North's greatest unknown sound scientists, from Martin Hannett over in Stockport's Strawberry Studios to Muslimgauze hidden away in Salford endlessly turning out his politically motivated experiments within sound and rhythm. Each track perfectly captures the urban surroundings from which they were crafted within, from the crumbling railway arches of Piccadilly train station to the snow covered winter walks through the widely expansive streets of Salford. Privilege blends the duo's penchant for greyscale post-punk with a cold winter ambience, slowly dripping through the floorboards from the room above in their base within the heart of Islington Mill.